I lost a lot of weight years ago, but I always struggle during the holidays. 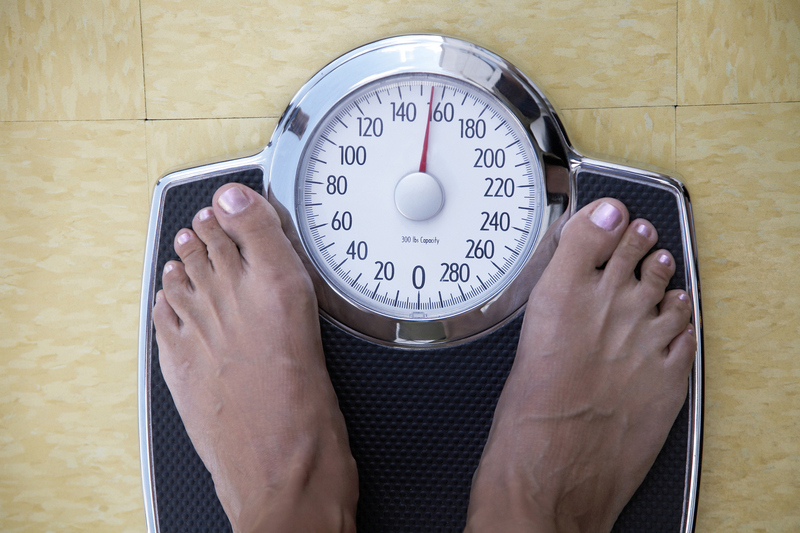 How can I make sure I maintain my weight over the next few months? You’re right that holidays pose a challenge when it comes to weight management. There are typically so many special occasions and gatherings that involve indulgent food and drink that it’s very easy to forsake healthful habits. Apparently, this can be more of a challenge for people who have successfully taken off weight than for people who have never struggled with weight issues. A 2008 study in the Journal of Consulting and Clinical Psychology compared holiday experiences of people who had previously lost a lot of weight (averaging about 75 pounds) and kept off much of it, and those who had always maintained a healthful weight. The researchers found those in the first group were more vulnerable to weight gain in November and December and less likely to be able to shed those pounds in January. Even though they made greater efforts to control their eating and stay active, their attention to weight and eating during the holidays decreased significantly more than their always-normal-weight counterparts. The authors suggested that people who have previously been obese need to work harder than others to manage their weight, and that the demands of the holiday season may overpower the resources they normally use to focus on weight control. What could be most helpful, they suggested, is to find ways to focus on and monitor eating, weight and physical activity during such a challenging period. Practice “mindful eating,” in which you deliberately find ways to become aware of what you eat and why you eat it. There are a wide range of approaches you can use, from reducing (or even eliminating) distractions while you eat to eating with your non-dominant hand. Seewww.thecenterformindfuleating.org for information. At a holiday gathering, see if you can choose not to eat when talking with others, and then take just a small portion of a favorite food and savor each bite. Revisit strategies that have worked for you in the past, including monitoring your weight and food intake. If you have a lapse, don’t dwell on it. Just use the experience to redouble your efforts afterward. Take time for yourself — whether it’s to enjoy a hot cup of tea or a 20-minute daily walk — during the busy holiday season. Slowing down can help keep you centered and focused on what’s important. Chow Line is a service of Ohio State University’s College of Food, Agricultural, and Environmental Sciences and its outreach and research arms, Ohio State University Extension and the Ohio Agricultural Research and Development Center. Send questions to Chow Line, c/o Martha Filipic, 2021 Coffey Road, Columbus, OH, 43210-1043, or filipic.3@osu.edu. Editor: This column was reviewed by Carolyn Gunther, nutrition specialist for Ohio State University Extension, the outreach arm of the College of Food, Agricultural, and Environmental Sciences. My boyfriend stores potatoes and onions in the refrigerator. I keep them in the pantry. Who’s right? Experts recommend potatoes be stored at a temperature between 45 and 50 degrees Fahrenheit, and that onions be stored in a cool, dry place. So, unless your boyfriend has a particularly warm refrigerator (which should be kept at 40 degrees or below), and unless you have a particularly cool pantry, neither of you are storing potatoes and onions in ideal conditions. Potatoes especially should be kept out of the refrigerator. 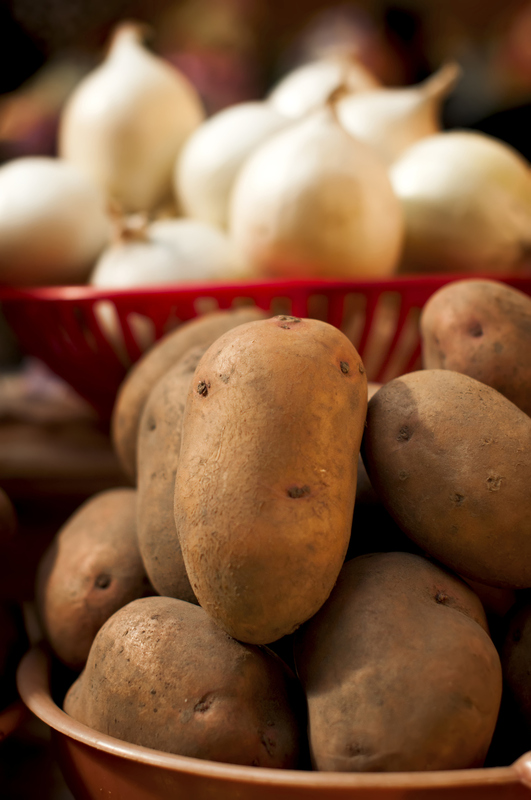 When stored at temperatures cooler than 45 degrees, starches in a potato begin to break down into sugars. Note: This is not how you make a sweet potato. The accumulation of sugars will cause the potato to darken when cooked. If you do have cold potatoes, it’s recommended that they be warmed gradually at room temperature before cooking to reduce the sugar levels and the risk of discoloration. Potatoes also store better in high humidity — as high as 90 percent. Not surprisingly, a root cellar would be the perfect place for potatoes. Barring that, store in the coolest, most humid place you can. But not the fridge. It’s also a good idea to keep potatoes in the dark. Overexposure to light can cause a buildup of solanine, an alkaloid that potatoes naturally produce to repel insects. Light also causes an increase in chlorophyll, which gives a green hue. So, potatoes that have a green tinge also likely have higher levels of solanine, which is toxic at high levels. Actual illness is rare because not only are solanine levels usually quite low, but because solanine actually causes cooked potatoes to taste bitter. Luckily, solanine tends to stay near the surface. Peeling off green areas of a potato will also remove any solanine. Potatoes that are stored too long or in too warm of a place will often sprout and begin to shrivel. If that happens, it’s time to throw them out. Potatoes with just a few sprouts can be salvaged by cutting them out. Onions need a lot less humidity — ideally, 65-70 percent — but just as much ventilation as potatoes. In fact, the National Onion Association says not to store onions in plastic bags, because the lack of air movement will cause them to go bad more quickly. Common yellow onions are hardier and will store longer than other types. White onions and sweet onions are moister and more perishable, and to keep them longer, the association suggests storing them in the refrigerator, but wrapped in paper towels first to keep dry. Editor: This column was reviewed by Linnette Goard, field specialist in Food Safety, Selection and Management for Ohio State University Extension, the outreach arm of the College of Food, Agricultural, and Environmental Sciences. My 6-year-old daughter is excited about trick-or-treating this year, but I’m concerned about how to limit the candy she eats afterward. What’s the best way to handle Halloween? Actually, Halloween can be a perfect time to focus on balance and moderation in the diet. Figuring out how to fit sweet treats into a healthy eating pattern is a good lesson to learn early in life. So, how do you do that? It can be tricky. Too much restriction could tempt your child to snitch the forbidden treats. 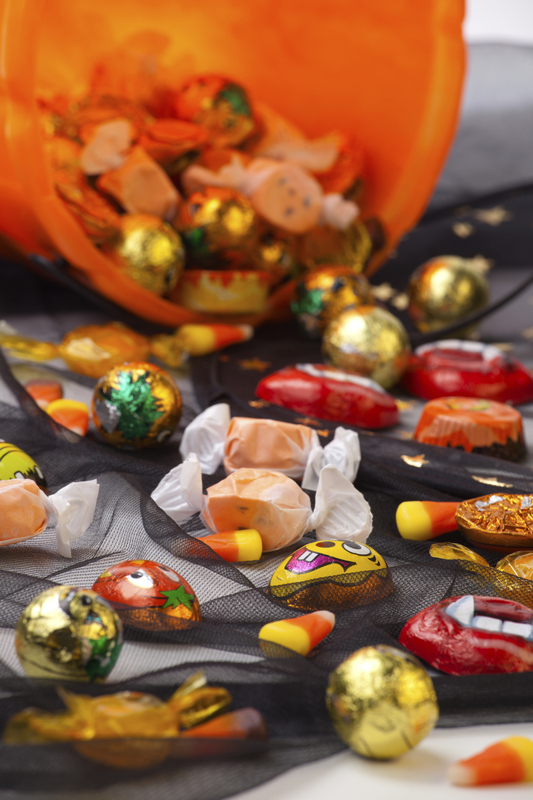 At the same time, keeping the Halloween haul within arm’s reach could lead to mindless munching and overindulging. Nutrition experts suggest talking with your child in advance about how much candy is a reasonable amount at any given time — normally one or two snack-size treats. Talk about when she would like to indulge —with lunch at school, as an after-school snack or after dinner at home? Don’t try to hide the candy from your child — you want to help her learn self-regulation in her eating habits, and that won’t happen if you take complete control. Rather, store it in a place that’s out of eyesight and is less convenient than healthier snacks. Research from the Cornell University Food and Brand Lab found that the visibility and convenience of a food consistently increases its consumption. So consider keeping the candy in a covered container in the pantry. As she gets older, encourage your daughter to choose a location for herself. Try to keep a bowl of apples, bananas or other fruit where they’re easily seen and can be grabbed for a snack. The fruit will help your daughter fill up on healthy snacks and crave fewer sweets, while at the same time learn how to incorporate treats into everyday healthy eating. Some parents “buy out” a portion of the collected candy. This allows children to keep their favorite sweets and earn money from, rather than consuming, the rest. You also might consider passing out both candy and other items for trick-or-treating. In a 2006 Yale University experiment, nearly half of 284 trick-or-treaters ages 3 to 14 chose a toy — stretch pumpkin men, glow-in-the-dark insects, Halloween stickers or pencils — over candy when given the option. This will help show your daughter that candy isn’t the only kind of Halloween treat. Perhaps the most important thing to remember is to be a good role model. If you binge on your child’s stash after she goes to bed at night, she’s going to notice. Instead, enjoy a treat with your daughter, and then put the container away for another day. I understand that people are advised to cut back on added sugars in the diet. But why? Is it just that they’re “empty calories” or are there other reasons? That’s a question even the experts are pondering these days. In the past, consuming too much added sugar was seen as a sickeningly sweet path to both weight gain and cavities, but if you kept your weight in check and your teeth in good shape, it wasn’t really seen as harmful in other ways. But in the last five years or so, new research is causing the scientific community to take a second look. 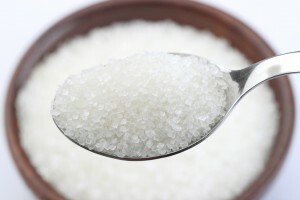 Studies and analysis in the scientific literature indicate that overconsumption of added sugars could in itself play a role in the development of heart disease. While not yet settled science, these ideas are worth considering. One example is a study, “Added Sugar Intake and Cardiovascular Diseases Mortality Among U.S. Adults,” that was published in April in the Journal of the American Medical Association. It examined data from National Health and Nutrition Examination Surveys conducted from 1988 through 2010, which included information from more than 31,000 people, along with additional information collected between 1988 and 2006 from nearly 12,000 people. After controlling for other risk factors, including high blood pressure, smoking, alcohol consumption, total calorie intake and obesity, the researchers found an association between higher added sugar intake and a higher risk of heart disease. The risk became apparent when added sugar exceeded 15 percent of daily calorie intake. That’s just 300 calories on a 2,000-calorie-a-day diet. You can get perilously close to that amount with one 20-ounce bottle of regular soda, not to mention added sugars typically consumed in other foods — cookies, ice cream, candy, breakfast cereal, and even foods like pasta sauce, granola bars, barbecue sauce, fat-free salad dressing and flavored yogurt. Some fruits and vegetables — carrots and other root vegetables, for example, and fruits such as bananas and grapes — provide more sugars than you might expect, but they shouldn’t be lumped together with foods that have added sugars. Fruits and vegetables offer so many other benefits, including vitamins, minerals, fiber and phytochemicals, that it’s important to eat more, not less, of them. The Dietary Guidelines for Americans recommends that adults eat 1.5 to 2 cups of fruit a day, and 2 to 4 cups of vegetables a day, depending on overall calorie intake. Editor: This column was reviewed by Irene Hatsu, food security specialist for Ohio State University Extension, the outreach arm of the College of Food, Agricultural, and Environmental Sciences. Stomach pain after eating apples? Sometimes when I eat an apple, I get a stomachache afterward. Could it be from pesticide residues? It’s highly unlikely that your stomach pains are coming from pesticide residues. In fact, there’s no evidence to support that notion. It’s true that apples tend to land high on the list of the highly publicized Environmental Working Group’s annual Shopper’s Guide to Pesticides in Produce. In fact, in its 2014 report, the organization said nearly all apples it tested were positive for at least one pesticide residue. Although that sounds alarming, the report doesn’t say much about the levels of pesticides detected. The organization uses data gathered by the U.S. Department of Agriculture to come up with its listings. In the data the group used for its 2014 guide, 743 of the 744 apples tested had residues lower than the government limits, most of them much, much lower. Remember, just because something is detected in minuscule amounts doesn’t mean it’s harmful. As with any substance, it’s the dose that makes the poison. Avoiding apples and other produce is a bigger risk: Their health benefits are well-documented. Still, the stomach pains you describe are not uncommon after eating apples. So, what’s going on? A food intolerance is possible. A set of carbohydrate intolerances are suspected to play a role in some types of abdominal pain. If the problem is severe, you’ll want to check with your doctor to get a diagnosis. The organization Food Intolerances Diagnostics suggests people with this type of intolerance avoid foods with a fructose content of more than 3 grams per serving, or a fructose-to-glucose ratio greater than 1. A fresh apple has 6 grams of fructose per 100-gram serving (or 3.5 ounces), and a fructose-to-glucose ratio of about 2. If this is what’s going on, only you can decide if you enjoy eating a fresh, crisp apple enough to endure any resulting discomfort. Finally, as with all fresh produce, don’t forget to rinse it thoroughly under running water first, preferably just before eating. That will dislodge any surface dirt and bacteria and wash it away. Editor: This column was reviewed by Sanja Ilic, food safety specialist for Ohio State University Extension, the outreach arm of the College of Food, Agricultural, and Environmental Sciences.